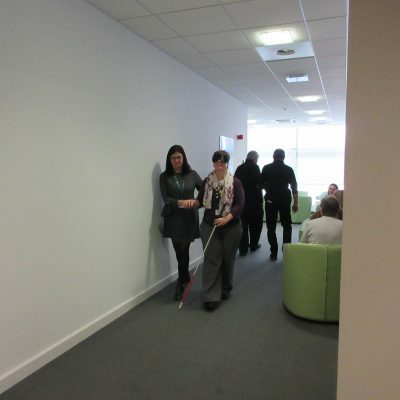 Delegates took part in our full day Disability Awareness course, a course that looks at the following areas. The right thing to say at work; to understand is to get it right! Appropriate Language & Signage; how not to get it wrong! Those involved found the course enjoyable and informative saying that they had a better understanding of the history of disability and how it has evolved over time. The course contains a practical element which is aimed at addressing access and customer service issues that people with varying disabilities may incur when using services. Richard and Gemma made the (difficult) questions easy to ask. Their fun, relaxed style makes for an enjoyable session, but makes sure we understand how we can become more accessible as an employer and a service provider. Thank you both! For more information on the training we provide visit our Training Consultancy Page. If you would like to book a course please feel free to get in touch, we can supply full or ½ day courses at your venue or in our training suite.